The cold front moved past and today was perfect; cool and sunny. We had a short 23 mile cruise to Goose Pond Colony Marina near Scottsboro (rather than Jackson Country Park) and arrived by 11:00AM. This is a first class facility with a very friendly staff. We cleaned up the boat and I worked on the water tank vent which was plugged up by a mud wasp. When the water was running since air could not get into the tank easily there would be loud booms occasionally as the tank contracted. Another hour was spent finding out the cable TV did not work and hooking up the satellite antenna. Then the tracking control box would not work but I managed to aim the antenna manually. Of course then I had to call DirectTV to have them authorize the receiver since I had not used it in such a long time. I found out the tracking control had lost its memory and had to be reinitialized. Isn't technology marvelous. However, we can now get Nashville TV on the boat. We borrowed the marina courtesy car and drove to Scottsboro for lunch in a neat little coffee shop on the square beside the town hall. 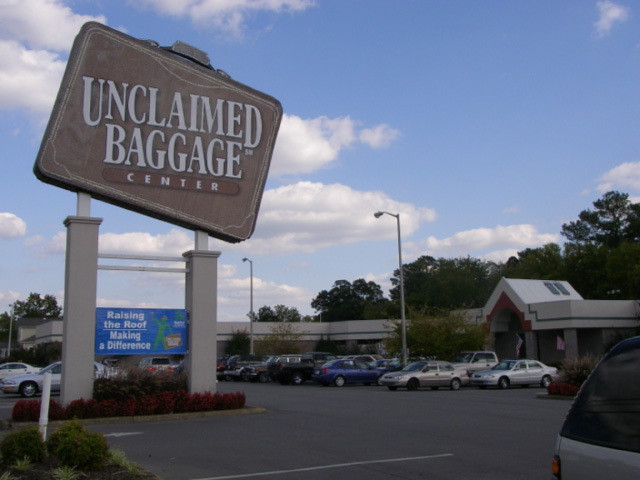 Scottsboro is best known for its unclaimed baggage center. All the bags that are lost on airlines and never claimed are shipped to this town. The contents are sorted and sold cheap in a large quite fancy store. Most of the store is clothes but some space is devoted to electronics and books. We bought a couple of books. There are 3 other boats here doing the loop and we all got together for cocktails in the marina picnic shelter. Tomorrow we will cruise 53 miles to Hales Bar the last stop before Chattanooga. I expect the current will run close to 2 mph so it will take 7 hours plus we have the Nickajack Lock to go through.